Every service you could need from EmCee & DJ. No matter what the size of your event from big or small; to any type including weddings, birthday parties, dance nights, trivia shows, and more we have you covered! In my experience, entertainment can make the most of any event. That entertainment, no matter what the form, must be provided by a professional who understands the crowd and knows what to do and when. I have worked hard to be able to provide you with the proper entertainment experience for any of your events. Take a look below at some of the services provided by myself and my entertainment professionals, and see if we can find something right for you. Over my years as a wedding DJ, I've learned how to make these days the easiest and most fun days you'll have ever! Weddings are supposed to be fun and wonderful events, I'll help to make your day the most fun you've had! No matter what type of party you are having, you can spice up the event by bringing out a professional DJ! I, and my other Entertainment Professionals, come ready to make your party or event memorable! We'll provide all the types of music that you can think of through any genre and style! Not to mention the ability add Karaoke, Trivia, Wicked Bingo or specialty games gives your party an added feather in your cap! Whether your looking for a traditional DJ experience with requests and music, or a full on dance party we can make your vision come true! 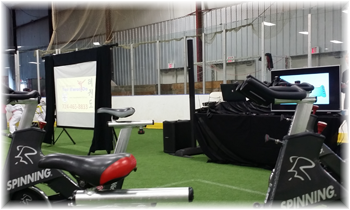 We provide professional sound and visual aids for any business event setting, plus fun! It's important to you that your guests or employees hear exactly what you are saying during those big business gatherings. We agree and are here to make sure that your microphones, screens, and sound works perfectly without any hiccups. We can help you plan and design the presentation for your business meeting, plus help you with team building exercises! As we state, being "More than a Play button" means that you won't have a DJ hiding behind a table at your event. I have worked in the entertainment business my entire life, and if there's one thing I know, it's that timing is everything. Whether you book myself or another one of my entertainment professionals for your event, you'll know that we will keep you and your guests entertained the entire night! We interact with your guests at just the right amount. Your grand introduction needs to be uniquely yours. We will make sure that the tone is just right for you on your entrance, and all the other announcements for the night. We know when to talk and when to let the music do the work! We'll entertain your crowd all through the night, not just with music but every time we talk on the microphone. We interact with you and your guests on everything from the cake cutting to the garter and bouquet and beyond! Don't worry though, we aren't over bearing and know exactly when to back off and let you shine in your special moments. We want you to relax! We've done this hundreds of time, and know exactly how things should go. After meeting with you and getting your plans worked out for the day we will make sure the day runs smoothly. We announce every event before it happens, most times giving your guests time to get where they need to go. We also work closely with your photographers, videographers, bar staff, and catering company to make sure they are all aware of what events are coming up next. We don't want you to worry about anything during the day, you are in good hands. I personally am an audiophile, I adore hearing music the way it was intended to be heard, clean, clear and crisp. I have been doing professional audio mixing since high school and have passed that knowledge along to my entire team. I also believe in being ahead of the curve on all things audio. That's why we only use the best audio equipment. We want to deliver the perfect sound every time, without dropouts, without distortion and without worry. Professional DJ Programs including Virtual DJ, Traktor, PCDJ and more! Our library has over 300,000 songs and grows to include new music every month! Whatever type of music you want for your wedding we have, or will get for you. Our set up allows for us to play high quality .MP3 or lossless FLAC files delivering you the highest audio quality. 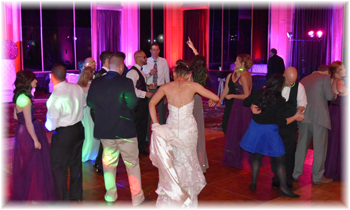 Our musical selection depends on what kind of songs you would like played at your event. While we have years of experience knowing what to play for crowds to keep them happy, we ask that you get involved too! When we meet with you before the wedding we'll ask if you have any songs that you want to hear or even do not want to hear, and we'll make sure that your personal request lists gets played and the do not play songs don't. As for the night of? Well, your guests are encouraged to come up and give us requests through the night! As long as their requests fit with your wishes we'll make sure they get played! We try to play radio edits or clean edits of songs that are requested. We know you'll have kids running around and often times parents aren't interested in their kids listening to the latest songs with absolutely no censorship. We tailor to that and default to playing either radio friendly versions of songs or cleaner. However, it is still your day! If you want songs played that are original or album versions, we will be happy to accommodate! Just know that we are thinking of you and your best experience even through the smallest details! You'll never forget the moment of walking into the room and it being washed in the colors that you have dreamt about since the planning started. This is the moment we attempt to capture with our multiple points of up lighting. It's amazing how much ambience these aimed and colored lights can really bring to a room and change the entire mood of the event! Multiple Points: We've found that no less than 10 points of up lighting typically does the trick to any room. Our entertainment professionals have all studied light design and will find the best places to maximize the usefulness of our up lights. Be it around the main table, in the corners of the room, or a full wash over the ceiling making it positively "glow." Know that we will work our hardest to make your room look amazing. State-of-The-Art Fixtures: Many DJ's bring traditional Par can style lights with bulbs and color gels, that's not what you'll find here! 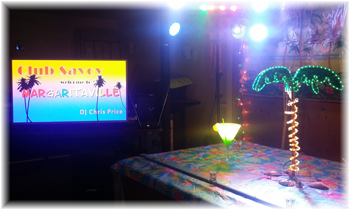 We use state of the art American DJ and Chauvet LED up lights that can be set to any color you wish! These lights use a minimum amount of power, are slim, and always stay cool to the touch so you never have to worry about accidents happening like with older light fixtures! Styles & Art: Up lighting is an art! I personally have spent years working in stage lighting and event rigging, and know the best ways to use the lights available! We will use our up lighting to create wash effects splashing color over either the ceiling or a full wall; pin spots highlighting small areas that are visually important or stunning; and columns to create a literal column of light in corners or up walls to help frame the room more. Our Crisp Smiles Photo Booth is the newest edition to the Crisp Entertainment family! Bring a ton of smiles to your event by adding our photo booth! We bring a professional photo booth that takes high-quality DSLR photos and then instantly prints them out on a photo strip customized to your liking fitting your events colors and message! Our booth comes with all the fun an exciting props you could imagine, and a professional attendant who is there to make sure you and your guests have the biggest smiles in your pictures! Digital Copies of All your photos and strips on a USB Thumb Drive at the end of your event! And Much more! Check out our Crisp Smiles website for full details and contact information!